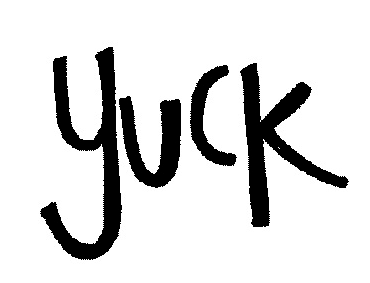 So yuck it up (fool around, act so as to cause laughter)…or poem about something that makes your gag reflexes go wild. Give us a poem of exactly 44 words (not including the title), and tuck some form of the word yuck in there somewhere. Feeling stuck? You can have some fun making up your own forms: yuckily, yucktastic, yuckalicious. Go wild with hyphens. Have fun with sound. Just pen your best yuck, and throw it at us. Just write a poem of precisely 44 words, including some form of the word yuck. Link it up by clicking Mr. Linky. Then truck your way around the blogisphere, where you’ll be lucky enough to visit some of the most talented poets around. The prompt is open for the whole week, so remember to come back and read (and write!) some more! Helloo, my intrepid Q-ers! Have a blast with today’s prompt. I’m pouring some cider today, since it’s finally a cool 72 degrees here in Southern Nevada. I think I’ll yuck mine up with a cinnamon stick. What can I pour for you? Ha.. I I’d love some cider… here it’s way cooler. Yuckin’ ay, this could be yuckin’ fun! So let’s all give a yuck. In yorty-your words no less. Hi everyone! Thanks for hosting with yuck, De! I’d love something non-alcoholic and warm please, it’s chilly here this evening! Cider it is, Kim! With a cinnamon stick. When I saw YUCK, I knew right away who was hosting! Fun. Glad you’re about to have some fun! Loved that, Walter! Needed the laugh today. Thank you! Ha.. I think I will write a second tonight… if the first was with Peanuts the second will be from Calvin and Hobbes. Yesss! That would be awesome, Bjorn. I just posted a second, as well. The word begs for some silliness. You got it, Frank. Always happy to pour a red. Cheers! Love this! It prompted a Silly Jilly 🙂 Thanks for hosting, De. Hi, Jilly! So glad you’re here. I LOVED your poem. Ha ha! Great word choice – I needed a bit of levity today…! Nice yucky word. 🙂 Thanks for hosting, De! Glad you like it, Frank! Have fun! An excellent word choice De. Unfortunately I went dark as I am in a depression right now. I just couldn’t get it up for fun. Thank you for trying to lighten our load! Toni, I hope you will ALWAYS write what you feel. I am praying for you, and sending hugs. Bless you De. I am in the midst of one of my chronic depressions and so much just tough it out. Sending so much love, Toni. I updated my old iPad the other day and now I can’t post anything. Grr. Hopefully get it sorted out soon. So sorry, Eric. Hope you get it worked out soon! If you mean you’re having trouble with Mr. Linky, I can post your poem if you put a link here in the comments. Love it! I’ll see if I can scare one up. In honor of YUCK, I shall pour myself at Jaagermeister, a flashback to the early 90s. Talk about yuck! I’ve heard that’s nasty. Yuck — the alcohol that made college students stupid! Yup. You can put me right on up in that mix. I worked in a sports bar, and had ample access to it. Yucky. Great fun De! I’m a red wine girl, all day every day. Thanks for making me put on my silly hat. We can all use that from time to time. It’s Thanksgiving in Canada. We celebrated earlier in the weekend, so today was free for some writing. Glad I could join in. Really not sure about counting hyphenated words, especially fabricated ones. Count me as one who tried. Hey, gang. I’ve read and commented on everybody, but my computer is being YUCKY. Please drop me a comment here, or on my own blog, if my comment doesn’t show up on your poem post. 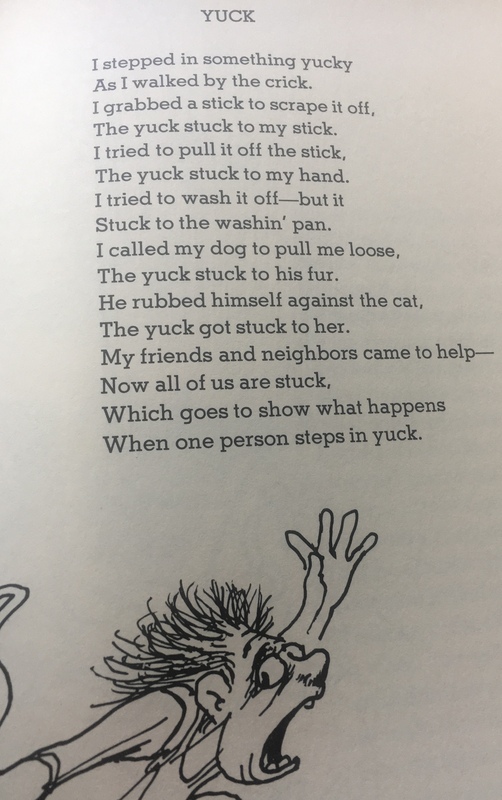 And please feel free to add a second – or third!- yuck poem today. I’m around off and on all day, and look forward to more great Q’s! OK, got one posted. Now to read everyone else’s. Yay! Heading over now, m.j.